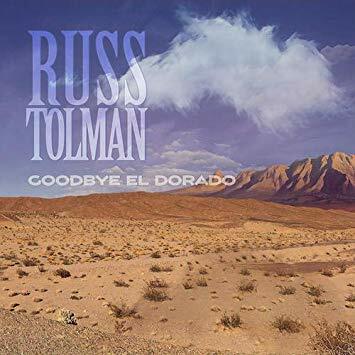 “Don’t call it a comeback …” warns the promotional notes on Russ Tolman’s eighth solo release. Still, it’s hard not to notice that the ex-True West guitarist, songwriter, and later singer, went nearly 20 years without a full album of new music. That dry spell was shaken in 2017 with Compass & Map, a 20-track solo career overview including a few new tunes. It ends now with this set, a 13-song love letter of sorts to Los Angeles. Those who had lost track of Tolman over the years might be surprised to find that some of the dark power of his work with True West has mellowed with time and age. That band which crashed and burned in 1985, had a raw, nearly psychedelic Americana gut-punch, perhaps best reflected by their taut cover of the Syd Barrett/Pink Floyd classic “Lucifer Sam.” On Goodbye El Dorado, Tolman settles into a strummy, pedal steel-enhanced country/folk jangle, underpinned by his acoustic guitar and strong backing from longtime associate multi-instrumentalist Robert Lloyd. Perhaps we shouldn’t be surprised that this sounds like a more C&W-oriented Dream Syndicate album. Three of Tolman’s band members worked in that legendary outfit who were contemporaries and friends with True West. Additionally, Tolman’s homey talk/sung vocals seem like a combination of Steve Wynn and Lou Reed if they went country. “The living here is easy and the weather’s mostly fine,” he sings on the title track, a loping sad farewell to his California stay with Mexicali trumpets, accordion and sweet pedal steel on this lovely, melancholy ballad. He tells the sad story of “just another California kid from a valley town” on “Kid,” the first single and an indication of the easy-flowing feel infused in every note. He appreciates the “California Winter,” a melancholy love song to both the state and a partner who he “lives for things you say,” but has left him. The set’s tone is exemplified by “Take It Easy Take It Slow,” since most of the tunes fall into that description. As appealing, elegant and graceful as performances like the opening “Los Angles” are, you can’t help but wish for more of the edge Tolman showed on his earlier solo work and especially in True West. The effect is also dulled by the 51-minute running time and a similar vibe throughout. While Tolman’s grit and honey voice is enticing, it starts to sound tedious as the disc ambles forward. Still, it’s great to hear Tolman making music again. Some might say he’s one of the architects of the Americana scene, one who seems revitalized and ready for the next stage of a career anyone would be proud of. Whether it’s a comeback or a continuation, he’s a survivor.